Nads' Bakery: Conquering.. the Macaron. On my recent trip to Vegas one of the birthday girl's wish was to stop by Bouchon Bakery before our trip back home so she could take some back for her and her family. This was my third time eating Bouchon's macarons and it gets better each time I eat it. To date I've tried the Vanilla, Pistachio, Coffee, Chocolate, and Raspberry. My favorite was and remains the vanilla. After eating these delicious bites of heaven and recalling the failed attempt in Philly I decided to give these suckers one more try. I had an article from LA Times I saved written by my favorite bakebook author, Dorie Greenspan, that had everything to do with macarons. 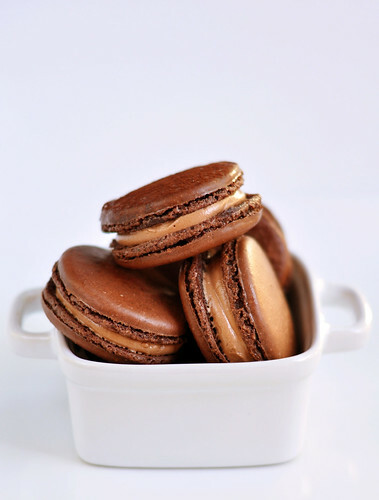 As I scanned through her recipes I saw one for chocolate macarons that she had adapted from the book she helped to write called, Chocolate Desserts by Pierre Herme. 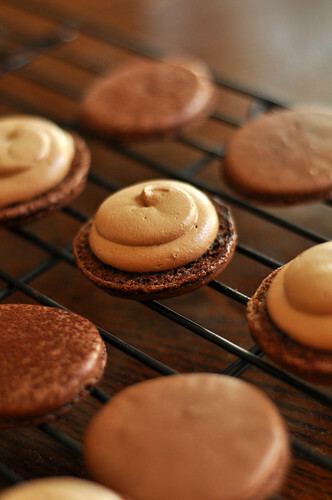 I had gotten the book some time ago but never attempted the chocolate macaron recipe that was in it. Now's a good a time as any. Line 2 half sheet pans with parchment paper. The key thing with macarons is to keep them all the same size since they're going to be sandwiched together. So, what I did was take a 1 1/2" round cutter and drew in circles so I could make sure when I went to pipe them, it would be all the same size. Just make sure to flip the paper over so the side with the ink is on the bottom. 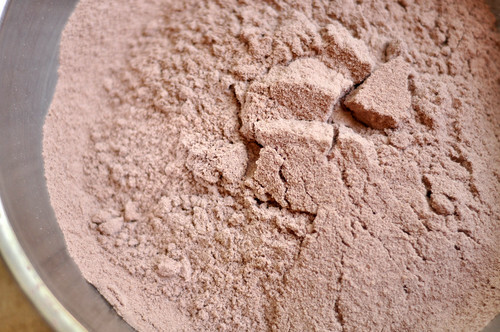 I had almond meal but I decided to ground it more in a food processor with the sugar and cocoa powder. Toss them all together in the food processor bowl and ground for at least a minute. Sift this into a bowl. It should look very fine. Don't worry if you still feel small chunks of almond. You'll notice I added grams in the amounts for the ingredients. I didn't want to take any chances so I used the grams. If you have an electronic scale it should come with that option.. if not, cups are fine as well. Make sure the egg whites are at room temp. In the book it says you can briefly microwave it in short bursts to get it warmed up. This is what I did. 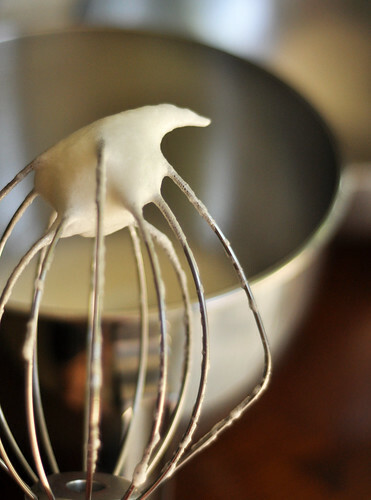 In a CLEAN bowl of a standing mixer add the egg whites and start off on low-medium until the egg whites get foamy. Then boost the speed up to high until soft peaks form. The peak should fall slightly to the side. 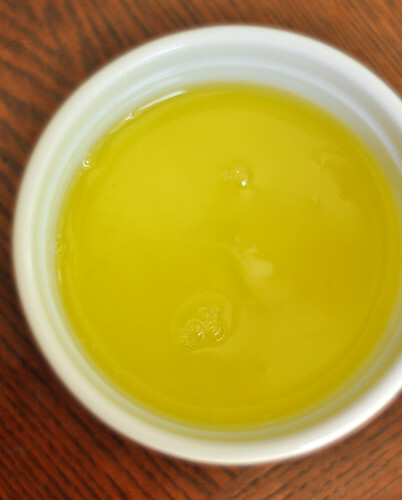 Transfer the egg whites to a large bowl and slowly fold in the dry ingredients. It'll seem like too much but just keep going until everything is in the bowl. It's going to get harder and harder to mix towards the end. Once all of the dry is incorporated it should look like cake batter. To pipe the batter I used a disposable pastry bag fitted with a large round tip. You can use a ziplock bag but just make sure it's the freezer, heavy duty kind because it'll break on you and that's one mess you DO NOT want to deal with. 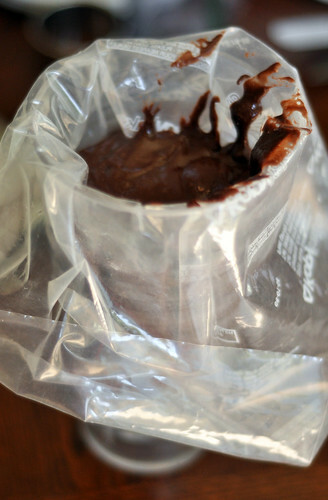 A trick I was taught in school was to use a cup or something tall to prop up the pastry bag to fill it. Somethings are a bit harder to do on your own, and this is one of them. 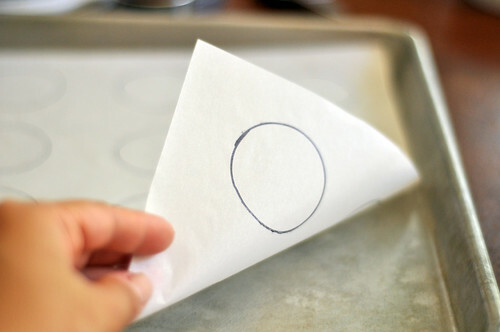 Take some of the batter and glue down the four corners of the parchment paper you prepped before hand so that when you go to pipe the paper doesn't slide around everywhere. Then just go steady from each circle to the next making sure that the batter gets spread as evenly in the stenciled circle as possible. This will ensure even rising of the macaron. It's at this point I could tell this was going to turn out well. The smooth matte finish is what you're looking for. 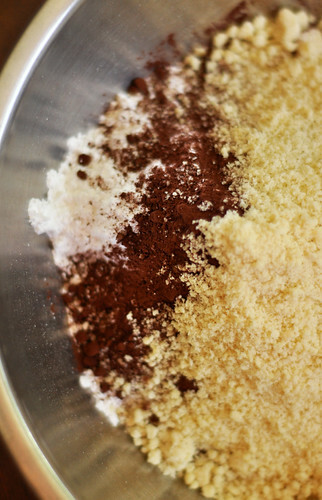 Pierre dusted some of his with cocoa powder and I did on some as well. NOW, start preheating your oven to 425 degrees. 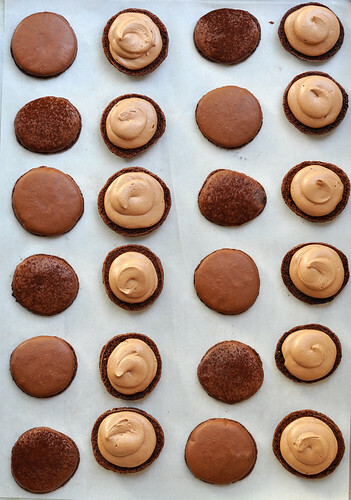 You want the macarons to sit for at least 15 minutes. 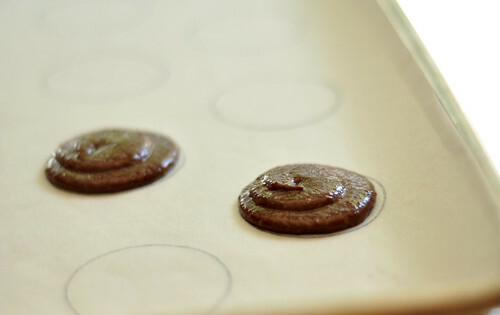 The book suggests you bake each sheet one at a time. I did and it turned out beautifully. The second sheet pan actually rose bigger and prettier than the first. When you put the sheet pan into the oven, use a wooden spoon to prop open the oven door partially. 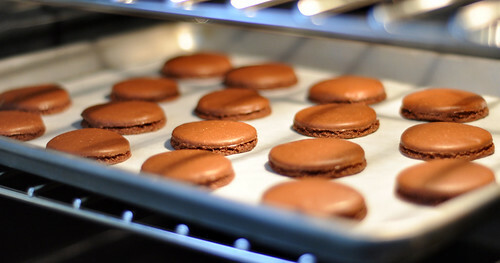 Bake for about 10-12 minutes or until the macarons are slightly firm to the touch. Here's where it gets a bit funky. Immediately after it's taken out of the oven it needs to be removed from the paper and placed on cooling racks. But, the macarons are pretty stuck to the paper. So what Pierre and Dorie tell you to do is have a small glass of water prepared (preferably with some sort of spout for easy pouring) to pour UNDERNEATH the paper. 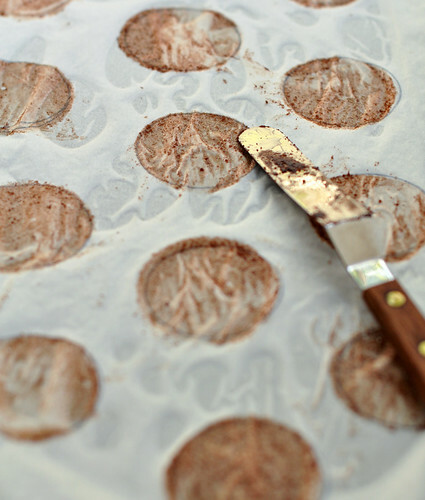 This will create a moisture barrier between the paper and the macaron causing it to release itself. 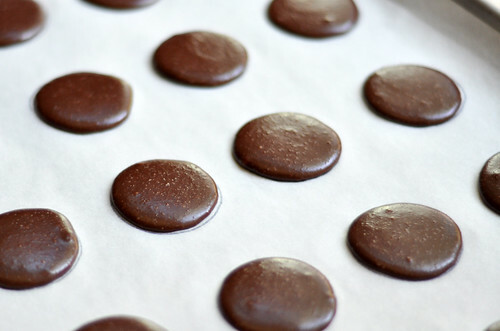 So after the macarons come out, carefully lift up one side of the parchment paper and pour maybe about an ounce or two of water underneath the paper then move the tray around so the water gets dispersed evenly . 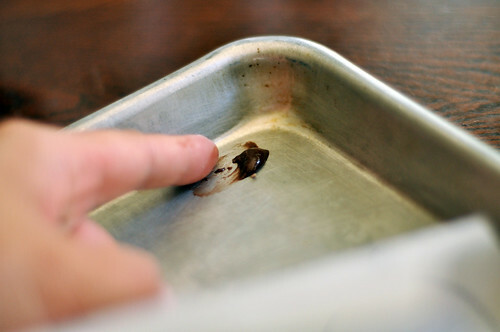 Then take a small spatula and lift off gently onto a cooling rack. Sounds crazy.. but it works. 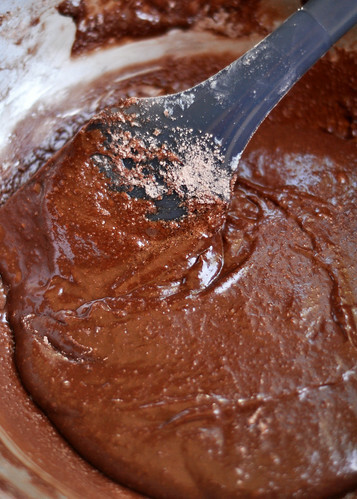 Combine everything into a large bowl and heat in the microwave in 20 second intervals stirring in between until all the chocolate is melted. You can let this set up overnight or give it a quick chill in the refrigerator. 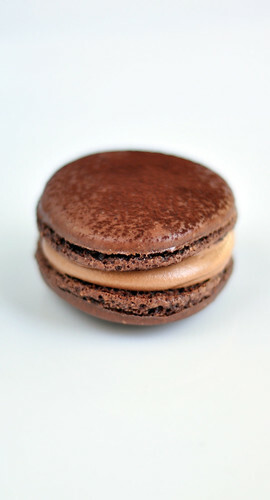 Match up the macarons and fill one side and sandwich together. Believe it or not, the macarons taste best after it's been filled and left in the fridge overnight. If you've ever had Bouchon's macarons they're in the refrigerator. I don't know why these taste better that way but it does. There you have it. 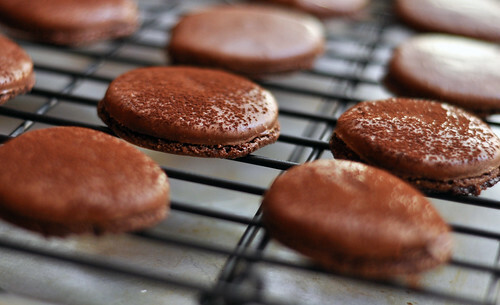 Chocolate macarons. Tasted just like the ones I ate from Bouchon's Bakery. 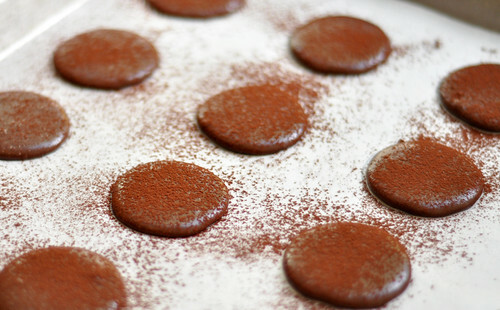 This was the easiest and most detailed set of instructions on making macarons. Maybe I'll finally get around to trying my hand at making them now! Hi. I noticed the recipe doesn't have granulated sugar or simple syrup to add to the egg whites. Most recipes call for one of the two...curious to know why this doesn't. Thanks so much! so u dont add sugar in ur egg whites when you whip it?